Jorge Sandoval has a lifelong involvement in cycling and always been a firm believer in giving something back to the community. The Masterton-based Chilean native, who is the race director of the New Zealand Cycle Classic which gets underway in the Wairarapa this week, has been recognised for his contribution to the sport including being the recipient of a Lifetime Service Award for Cycling New Zealand Road and Track last year and in 2006 he was made an Honorary Member of the New Zealand Order of Merit for his services to cycling. But this week his contribution to the community will be recognised in a unique way. 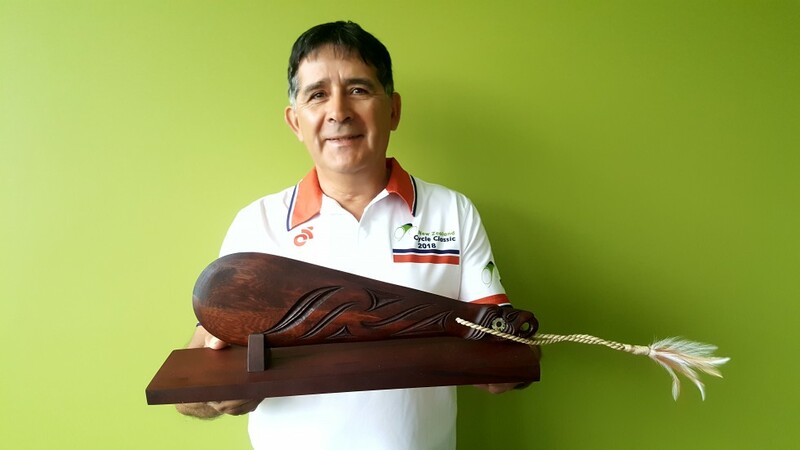 Mr Sandoval will present the winner of the 2018 UCI 2.2 New Zealand Cycle Classic with a special Maori carving which has been crafted by an inmate at Rimutaka Prison from Rimu wood and signifies wind and sea. Mr Sandoval has been mentoring inmates through a volunteer role with the Department of Corrections for the last eight years with the view to teach inmates life skills. Mr Sandoval says he feels a huge sense of reward mentoring inmates. “I find this volunteer work extremely rewarding and if I feel I can make a positive difference to someone’s life, then that is amazing,” says Mr Sandoval. The 31st New Zealand Cycle Classic begins in Masterton on Wednesday morning with a 122.5km stage taking the field of over 100 riders representing seven nationalities towards Eketahuna and back. It concludes five days later on Sunday, with a fast and furious 120km circuit race (riders complete 12 laps of a 10km circuit just on the outskirts of Masterton. The official welcome to all teams will be held during a festive evening tomorrow night at Mitre 10 Mega in Masterton. This promotional evening, which is part of Huri Huri bike festival, will include a freestyle BMX display; fun cycle obstacle course for children; a free barbecue and a promotional circuit ride for club riders. The elite teams will also ride the same Criterium circuit enabling spectators to get a taste of what exciting, international racing will unfold in the coming days.